Diane Corcoran, R.N., Ph.D., C.L.N.C. Ms. Corcoran has had a distinguished military career spanning 25 years during which she earned her PhD. During her military service in Vietnam, Ms. Corcoran was introduced to the Near-Death Experience. Since then she has worked to educate healthcare professionals and lay communities on the Near-Death Experience. She is a founding member of IANDS and has served as a member of the Board of Directors as well as President. Currently she is researching veterans who have had a Near-Death Experience in combat. Ms. Corcoran has lectured nationally and internationally and has published several articles on NDEs. Bruce Greyson, M.D., Janice Holden, Ed.D., & Jeff Long, M.D. Corroborative NDErs appear to perceive accurately from a vantage point outside their physical bodies earthly events imperceptible from the vantage point of their physical bodies and otherwise unknowable to them. Corroborative NDEs hold great promise for providing evidence that NDEs are "real" and that consciousness is more than a product of brain activity. 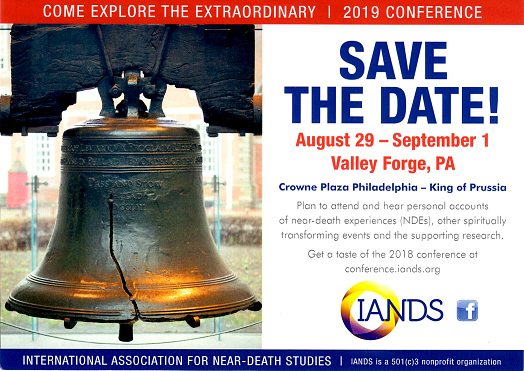 The presenters will review the professional literature about corroborative NDEs; will report the results of a current, large-scale study of self-reported corroborative NDErs; will describe a planned experimental study of corroborative NDEs in the hospital setting involving computer animations; and will seek feedback from participants and answer their questions. NDErs who have had corroborative NDEs are especially invited to attend, as is anyone interested in the topic. Bruce Greyson has served as an Attending Psychiatrist in various health care facilities since 1976, and as professor of psychiatry at numerous universities. He has presented at Regional and National conferences, is a member of numerous professional societies, and has been the principal investigator for several research studies. He currently serves as editor of The Journal of Near-Death Studies (opens in a new window) and has published extensively in professional journals. Janice Holden has an Ed.D. in Counselor Education. Her areas of expertise are transpersonal perspectives on counseling, counseling theory and technique, couples counseling and sexual dysfunction therapy, dream work in counseling, and secondary school counseling. She is an active member in several national and international professional organizations. She has published numerous articles, book chapters and books. Jeffery Long earned his medical degree in 1981. He is board certified by the American College of Radiology, Therapeutic Radiology. He is currently Co-Medical Director of the MultiCare Radiation Oncology department at Tacoma General Hospital. Dr. Long has published numerous articles in professional journals. The work of the Danish mystic Martinus (1890-1981) substantiates what happens during an NDE. As human consciousness consists of electromagnetic rays (ray-formed, non-physical matter) and as this type of matter is indestructible, the human consciousness survives physical death. Ray-formed matter is measurable and contains not only consciousness, but also the life-force of the being (hence the flat line when the life force leaves the body). The ray-formed matter constitutes a field of energy and this field contains the self or "I". The physical body is only the instrument of the "I" and the brain is the plug through which the energy field electrifies the body. We are essentially the same whether we have a physical body or not, as the core of our being consists of another type of matter than physical matter. Death is an illusion. Ms. Byskov obtained her MA and BA from the University of Aarhus, Denmark. She has completed extensive research of the Danish mystic Martinus (1890-1981). Her book "Death is an Illusion", publishing the main points of Martinus holistic worldview. Ms. Byskov lectures locally about the fascinating insight revealed by this extraordinary spiritual teacher. This presentation examines what was experienced by those who had an in-depth near-death experience between the time they left their physical body and when they entered the realm of light. Harold Widdison obtained his Ph.D. in 1970 at Case Western-Reserve University. He has taught courses on death, grief, and bereavement for 20 years. Mr. Widdison has published numerous articles in professional journals and has presented at state, national and international conferences. This presentation makes a bold proposal. Putting it very simply, there are two possibilities: that human consciousness continues to exist in some form after bodily death, or that it does not. Every major religion maintains that people do continue to live in some form after death, and that the ways we live here now will affect the ways we live after death. People who have had NDEs strongly echo that viewpoint. This presentation proposes that we scholars, counselors, and doctors try to find a middle ground between the "materialists" and the "believers," to provide genuine hope to dying people without imposing particular views upon them. This middle ground includes the ideas that: (1) invisible energies or forces not yet discovered by human sciences affect our lives, and (2) there may be another dimension in which the conscious core of human personality continues to exist after leaving the physical body in death, as is suggested by many NDE reports. This position is in danger of being rejected by both materialists and sectarian religious people, because it rejects some portion of each side. On the other hand, it offers the strongest and fairest hope for a genuine religious response to the crisis of terminal patients, with what William James called "healthy-minded religious optimism." Carl Becker received his Ph.D. from the University of Hawaii in 1981. He has researched NDEs in Japanese hospitals and literature for 30 years. Mr. Becker has published numerous books on bioethics, death and dying, and NDEs in both Japan and the United States Currently, Mr. Becker is a Professor of Bioethics and Comparative Religion at Kyoto University, Kyoto, Japan. A report from a double near-death experiencer. Paul Elder is the mayor of a small city in Canada. He has twice experienced the illusory transformation referred to as death: a drowning at the age of 12, and a heart attack while playing hockey at the age of 41. In this presentation he provides an in depth account of the dying process itself, along with a description of the accompanying out-of-body experiences that literally change lives. Elder claims that these extraordinary, but natural, experiences carry a tremendous impact. They wield the power to transform our belief systems and lives into a profound new understanding of what and who we truly are, also revealing the one, single thing that matters most. Individual who have Near-Death experiences have after effects that may be difficult to deal with under normal circumstances. However, soldiers who have these same issues are often in environments that they have little control over and can't just stop what they are doing and choose to do other things. They may very well have to go fight again and hurt other people and do things that may be very upsetting to them. It is therefore very important that military providers be familiar with the after effects and the integration process so they can assist military experiencers in their efforts to integrate the NDE into their life and their current military mission. Research has shown that numerous NDErs have been abused as children. Marlene will describe how, as a result of her NDE, she discovered that she had been abused as a child. Her NDE brought forward the realization that scenes of her early life had been blocked from her memory. The discussion will take the audience through the steps that became necessary for coming to terms with her experience, including how her NDE provided her with the ability to ultimately overcome the adversity of her childhood abuse. Marlene Krohner earned her BS in 1970 at Wayne State University. In 1992, Ms. Krohner experienced an NDE. Ms. Krohner has presented at several universities. B. Jason MacLurg, M.D. & Linda Jacquin, C.A.S. Those who have had a near-death or profound paranormal experience frequently return to an unsympathetic environment at the same time as they are bubbling over with joy. They may question the values of their prior religious or social community. Many wish to change their occupation, their life's direction, or the lives of those around them. Such efforts frequently meet with resistence that leaves the experiencer feeling isolated and confused. Concerns about insanity or "losing one's mind" are not uncommon. Heath care professionals, in our zeal to heal, may inadvertently produce psychological or social trauma for the person who is trying to make sense of this most profound event. Specific guidelines will be presented to help the clinician to recognize and manage the post-NDE state. B. Jason MacLurg earned his M.D. in 1983 at the University of Washington and completed his psychiatry residency at the University of California in 1987. Currently he has a full-time private practice of adult and geriatric psychiatry, including medication management and psychotherapy. Dr. MacLurg is a member of several professional organizations and has been published in professional journals. Linda Jacquin is a businesswomen who has been a member of IANDS for many years. She has had two NDEs, once as a child and once as an adult. Ms. Jacquin will discuss her NDE, how they were responded to by professional caregivers and by her family. Since completing his graduate coursework in counseling psychology, Skip Atwater has held several positions to include college instructor, scientific investigator and human behavioral engineer. He also served as Operations and Training Officer in the US Army Intelligence remote-viewing surveillance program. Since 1988, Mr. Atwater has served as Research Director at the Monroe Institute. He is vastly published and speaks at national and international conferences. In keeping with the continuing development of methods and techniques promoting the evolution of human consciousness, this qualitative study of the "Healing/Regeneration Center," a venue purportedly experienced following death, examined the subjective reports of 89 volunteer participants. Participant applications and in-program questionnaires were analyzed with three different techniques: hermeneutics (word meaning), semiotics (symbol interpretation), and the narrative and metaphor (story analysis) method using computer-analysis software, QSR Nvivo. Results indicate that the nonphysical healing/regeneration process involves the presence of spiritual beings, the experiences of love, energy and light, and happiness or enjoyment. The key to maintaining optimal health is to express love. The participants descriptive similarities of the realm labeled the Healing/Regeneration Center imply a shared view of the afterlife or, in Jungian terminology, a collective unconscious phenomenon. The incidence of recipient awareness of changes in their memories and other aspects of their consciousness associated with their donor is unknown. Interviews with transplant recipients, recipient families and friends, and donor families and friends suggest that the effects of immunosuppresant drugs, physiological and psychological stress of the precipitating condition, treatment, and surgery, and statistical coincidence are likely insufficient to explain the documentation in 10 cases of 2 to 5 parallels per case between changes following surgery and the histories of the donor. This presentation outlines the theory and research on "cellular memory," energy cardiology and the possibility of "heart-to-heart connection across time and space. Dr. Pearsall is a licensed clinical psychoneuroimmunologist. He earned his Doctor of Philosophy in Clinical and Educational Psychology at Wayne State University in 1968. Currently he is a Clinical Professor in the Department of Nursing at the University of Hawaii at Manoa. He also serves on several advisory boards at both the University of Hawaii and the University of Arizona. Dr. Pearsall is vastly published in medical and scientific journals as well as an author of 15 best-selling books. This presentation has been designed and implemented to assist health care professionals of all types, to factor Spirituality into their perception of health care. Attitudes of health care professionals are discussed and the messages they convey are examined. We all have our individual thought patterns, and these can be as contagious as our attitudes. Participants are encouraged to study their own tendancies to entertain or send out discounting messages. How to help promote a positive, healthy, self image is revealed and strategies are recommended for radient health and healing. Ms. Chicca holds a MA in Counseling Psychology. She has provided counseling for individuals, couples and families since 1992. She is the founder and facilitator of IANDS San Diego. This panel discussion includes medical professionals who themselves has had a near-death experience as well as people whose practice has been influenced by their knowledge of NDEs. Dr. Kircher went through her own near-death experiences early in life. She earned her medical degree in 1979 and completed her residency in Family Practice in 1982. Dr. Kircher is board certified in both family practice and hospice care. Currently she serves as the Medical Director for the Wellness Center at Mercy Medical Center in Durango, CO. She is a member of several professional associations and speaks nationally on end-of-life issues and Near-Death Experiences. While many women have endured episodes of domestic violence, childhood sexual abuse and bulimia nervosa-some survive... and thrive. What happens to the cycle of violence and abuse when a Near-Death Experience occurs? How does the healing process unfold? Case studies will elucidate the fundamental change in perspective that leads to hope and change. Based on research studies, comparisons will be made to victims of chronic abuse without NDEs. A psycho-physical scientific explanation for the apparent enhanced healing will be offered. Dr. Colli earned her Ph.D. in Clinical Psychology in 1997. Her psychotherapy practice encompasses both orthodox psychology and the psychology of spiritual experiences. Dr. Colli researches the role of trauma in entering transpersonal or spiritual realms. Her expertise includes working with survivors of life-challenging illness. She has presented at national conferences. Dr. Colli has also published in local and national journals. Hob Osterlund, R.N., M.Sc., C.H.T.P. Healing Touch (HT) is an energy-based modality commonly used to facilitate care of the dying person. In this session, HT theory, techniques and experiences will be described. Special attention will be given to the energetic assessment and perceptions of the practitioner, as well as those left to be shared with the terminally ill client. Ms. Osterlund earned her Masters of Science in Nursing in 1985 at the University of Hawaii Manoa. Currently she is Clinical Coordinator for Pain Management at Queen's Medical Center in Honolulu. Ms. Osterlund belongs to several professional organizations, and has published in many professional journals. She is also a well-known local and national speaker on pain management, healing touch, and the use of humor in healing. Everyone experiences the reality of death, either through their own experience, or through the deaths of others. I have been brought to this reality consciously, and discovered that my highest essence, or God self, was not quite sure if he desired to leave earth or stay. He has many abilities, and I had been learning how to alter cellular memory. He felt that I had really come up in my desire and mindfulness to help others, so he and God, or the source of all that is, hammered out a new contract. I consciously needed to be altered into a whole-hearted individual who would be able to alter others in a new dynamic way that would be acceptable to "Source". My God self's choice was my near death experience. My intention is to explain to all the feelings of a person who has been given a "fresh start". I also will demonstrate this reality of oneness that I now have. I expect that the reality of some who attend this conference will be changed. It is both my God self's and my desire for everyone to be happy, healthy and to grow to their fullest potential. We both choose to come and assist. Mr. Kaplan has been a successful businessman in Boston, MA for over 30 years. After his NDE, he accelerated his volunteer practice of healing persons through intuitive guidance. Jeff Long, M.D. & Jody Long, J.D. Over 250 NDErs have responded to a web form questionnaire on the Near-Death Experience Research Foundation (NDERF, www.nderf.org (opens in a new window) web site. Two relevant questions were analyzed in depth. "Has your experience resulted in changes in any of the following:" including "Increased sensitivity, healing or psychic abilities." The second question was "Did you have any psychic, paranormal or other special gifts following the experience?" A chi square analysis was performed. Careful analysis of the narrative responses will clarify the spectrum of psychic and healing gifts described by NDErs. The presenters will compare the findings of this study with results from other published research. Discussion will be encouraged. NDErs with psychic or healing gifts are invited to attend, as is anyone interested in the topic. Jody Long, an attorney, has researched paranormal phenomena for several decades. She serves on the board of directors of Seattle's Friends-of-IANDS group, and is webmaster of the NDE Research Foundation. This presentation explores the psycho-social-spiritual components of the NDE and a individual's experience as they return to their physical bodies and live with the after-effects. The adjustment process of living with expanded awareness will be discussed, drawing upon case studies, research, and the presenter's own NDE. Particular focus on the phenomena of telepathy, healing abilities and kundalini awakening will be emphasized, including effective techniques to stabilize and/or diminish the effects if they become intrusive. The presenter will demonstrate a particular phenomenon, an ancient wisdom language given to her during her NDE, that she utilizes in her work as a clairvoyant consultant and lecturer. Ms. Karunamaya holds a BS in Sociology. She is a near-death experiencer and currently works as a Clairvoyant consultant and lecturer. After a long career in medical/academic social work in critical care, cardiology and bone-marrow transplant, Kimberly Clark Sharp, MSW, maintains a practice exclusively serving near-death experiencers on individual, group and community levels. How this came to be and how others can follow suit is the basis of her presentation. Ms. Sharp earned her MSW in 1976 at the University of Washington and founded the Seattle chapter of IANDS in 1982. She is widely published in journals, textbooks and magazines on the subject of near-death experiences. Ms. Sharp has also lectured at national and international conferences. Not enough attention has been paid to the youngest of near-death experencers: newborns, infants, toddlers, and those under the age of six. We are fascinated with "out-of-the-mouth-of-babies" stories, yet we fail to examine the aftereffects as related to the particular challenge children face with their agemates and family members, in school, and throughout their growing years. In this presentation, I focus more on research findings that suggest subtle yet major changes occur in the brains of our tiniest experencers, changes of an evolutionary nature. Because the work of Linda Silverman, Ph.D., one of the nation's leading authorities in advanced development and giftedness, so nearly matches my own, I believe it is time to reconsider what might be happening to little ones when they are impacted by the sudden intensity of a near-death state. Ms. Atwater is one of the original researchers of the Near-Death phenomenon, having begun her work in 1978. She speaks nationally and internationally on the subject of NDEs and has published several landmark books. Near-death life reviews pose a challenge to current memory research in terms of the sheer amount of instantaneous and empathetic information recalled. Advances in Quantum Bio-mechanics (quantum physics of the human body) support, for the first time, a scientific basis for ND life reviews. Microtubules, DNA, and the brain are described as communicating non-locally with virtually unlimited memory storage capacity. The Quantum Hologram will be introduced, through which non-local (instantaneous) communications are believed to take place via the zero-point field (ZPF). Mr. Beck completed his Ph.D. in Transpersonal Psychology in 1996. Currently he is in private practice as a psychotherapist, providing individual and relationship counseling for adults. Dr. Beck has been involved in consciousness research for many years. He has published articles on transpersonal experiences and consciousness, and has presented nationally on these subjects. An open discussion to explore the challenges and pitfalls that have beset many of us as we have sought to reclaim the power and ecstasy of the NDE or similar STEs. It will be an open gathering designed to explore the experiencer's and the consciousness researcher's quest to simulate or recreate the NDE or STE thru 'less than positive' behaviors. Participants will be asked to respect each others opinions and anonymity, allowing for each person's point of view without retort or critique. P. Edward Salisbury, a near-death experiencer earned his Doctorate in Divinity in 1982 at Berkeley. He has worked for over 20 years providing compassionate care and counseling to the dying and their families. Mr. Salisbury has lectured locally and nationally on near death experiences, death, and dying, and has published numerous articles on these topics. Mr. Gaylord is a psychotherapist in private practice and a chaplain in hospital and hospice settings. He has been a student of meditation for 25 years and is a near-death experiencer. He holds a master's degree in Transpersonal Counseling Psychotherapy and is the founder of Boulder, Colorado's Friends-of-IANDS support group. Janice Holden earned her Ed.D. in Counseling Education in 1998. Her areas of expertise are transpersonal perspectives in counseling, counseling theory and technique, couples counseling and sexual dysfunction therapy, dream work in counseling, and secondary school counseling. She is an active member in several national and international professional organizations. She has published numerous articles, book chapters, and books. Cassandra Musgrave is a spiritual counselor, educator and writer based in Santa Rosa, CA. Her NDE research was published in the, Journal of Near Death Studies (Spring 1997). Ms. Musgrave is an IANDS board member and near-death experiencer. In an article published in the Scientific American book, The Hidden Mind, David J. Chalmers pointed out that the existence of consciousness is simply not derivable from our present laws of physics. For a true 'theory of everything', the existence of consciousness must be derivable from physical laws. He therefore proposes that consciousness is a fundamental physical property that obeys a set of natural laws that we do not have enough information to formulate. This presentation reviews the descriptions of the behavior of consciousness as found in the literature about NDEs and other related fields and develops such a set of hypothetical physical laws. Dr. Brumblay completed his Medical Degree in 1978. He completed his residency in Emergency Medicine in 1981. He has served in various positions in emergency medicine for the last 20 years. Currently he is the Medical Director for the Emergency Medical Service Division for the City and County of Honolulu. Dr. Brumblay founded the Oahu chapter of IANDS in December 1998.